Our two coasts – Maine and Washington – were linked via modern technology to bring eNews readers the story of Nancy Ayer, resident of Orcas Island, Washington and St. Croix, U.S. Virgin Islands. Nancy believes that she and the labyrinth found each other about 12 years ago when she came upon her first labyrinth in Kanuga, North Carolina. She was in graduate school, pursuing her degree in depth psychology, mythology and education. Believing she might sometime use the labyrinth for a future course project, she photographed the guidelines beside the labyrinth. The perfect opportunity soon came for that project, and she found herself buying a 40-foot canvas labyrinth which she later donated to her church, Emanuel Church, in Eastsound, Orcas Island, Washington. She gave a workshop for 20 women in the community, following the photographed guidelines and her own intuition. Feeling a pull to continue offering the labyrinth, a Halloween event was scheduled where she invited the children and adults to come move through the labyrinth in their costumes. That tradition has continued today with a 500-pound pumpkin recently adorning the center of the outdoor labyrinth. That first Halloween event was the next step in her awakening to the powerful tool a labyrinth could be. Her first introduction to Veriditas was her facilitator training at Grace Cathedral in 2008 with Lauren Artress. Traveling twice to Chartres with Lauren, she was profoundly moved by the Cathedral labyrinth with its basis in sacred geometry and symbols. Ever since, she has used the six petals in many ways and continues to connect deeply with symbols. Her labyrinths in Eastsound and St. Croix use the 7-circuit Chartres design. Nancy maintains that the labyrinth was and continues to be her teacher. Once again, acting on her intuition, she imagined an outdoor labyrinth situated in the perfect green space next to the church garden in Eastsound. Upon her return to Washington, she began what turned out to be a long, complex pilgrimage with the labyrinth and its presence on the church property. For over five years she worked with the bureaucracy of the church, the congregation, and the officialdom of the State of Washington while seeking permission to build a permanent labyrinth. The historic church in the center of town is on the site of an ancient Indian midden. Great concern existed about disturbing any ancient artifacts or bones. Persisting, she spray-painted a labyrinth on the grass to illustrate what it might look like in the gardens outside the church. Gathering a group of people together, they began asking for donations. Commencing in the labyrinth’s center, they asked for $2000 per petal. In no time $12,000 was raised! Believing the labyrinth wanted to be built on this historic, waterfront site, Nancy summoned the courage to ask the vestry, most of whom were intolerant to change, to match whatever money the committee raised. To her surprise, they agreed! The labyrinth was built using bluestone and grass as the pathway. A video was made of the actual creation of the labyrinth. Nancy understood the power and ancient traditions behind building a sacred site upon another sacred site and called upon members of the Lummi and Samish Indian Tribes to bless and dedicate the labyrinth upon its completion. A vivid lesson from this labyrinth experience involved Nancy’s own expectations. She had expected continued support from the pulpit and the church parish, but that didn’t occur. She found herself being the one to initiate each step. She, along with the small committee, had given the labyrinth birth and produced the brochure, but the aging church parish weren’t walking it. She feels the universe brought Warren Lynn to Orcas Island at that critical time. He helped her to see that the labyrinth was now built and will have a life of its own. She would have to let it go and leave it to the universe. She also learned that she was the one who had to write or speak about it. The labyrinth called forth her voice. Town people and tourists started to walk it, and the labyrinth has stayed. Nancy has a strong understanding now that “It isn’t about me.” The labyrinth wanted so badly to be there, and that driving force was bigger than any one person or group of people. Nancy acknowledges that her primary love is offering the labyrinth openly to people. 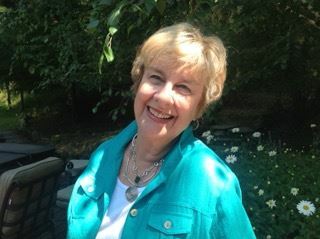 For several years she has been asked to offer the final session on the labyrinth to an annual grief group on Orcas Island. She uses the canvas labyrinth indoors for this session since it is more private than the public outdoor labyrinth. Nancy’s deepest personal connection however, is to the property and labyrinth at Estate Mt. Washington on the island of St. Croix. In the 18th century, the Virgin Islands were at the center of world trade having an extensive network of sugar plantations and slavery. Nancy and her husband Tony found the lost ruins of a former sugar plantation, Mt. Washington, in 1984. They have slowly stabilized the stone walls in the sugar factory area, planted gardens among ancient trees and restored the great house for their home. She built the labyrinth for her personal use but soon realized something this profound cannot be kept to oneself; it must be shared with the world. So she opened it to the public. The plantation ruins offer visitors a tranquil backdrop for peace and contemplation as well as historic legitimacy. She struggles to find the words to describe the beauty of these walls and ruins. The Ayers have the names of all the slaves on this plantation since 1750 and have created a self-guided tour of the site and labyrinth. This 7-circuit Chartres-design labyrinth nestled in the historic ruins has brought her the greatest joy. She built it herself and remembers well the heavy physical labor of carrying all the stones up from the sea. The labyrinth is down the terraced hill yet in sight from their home. 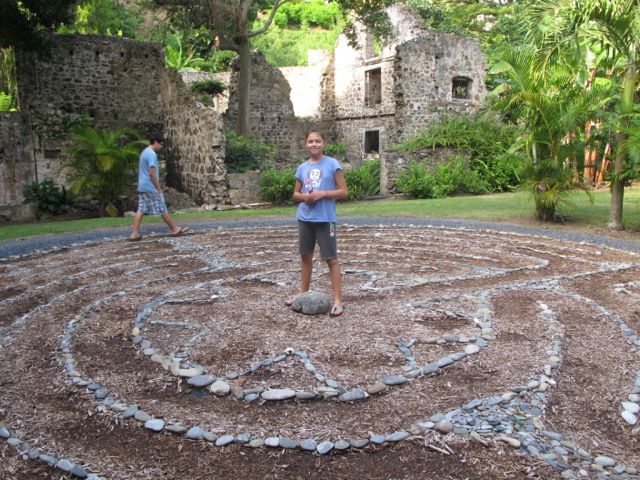 She walks this labyrinth two or three times a week during her six-month-a year residency on St. Croix. She firmly believes that the labyrinth has helped to heal the blood of St. Croix with its deeply entrenched history of slavery. 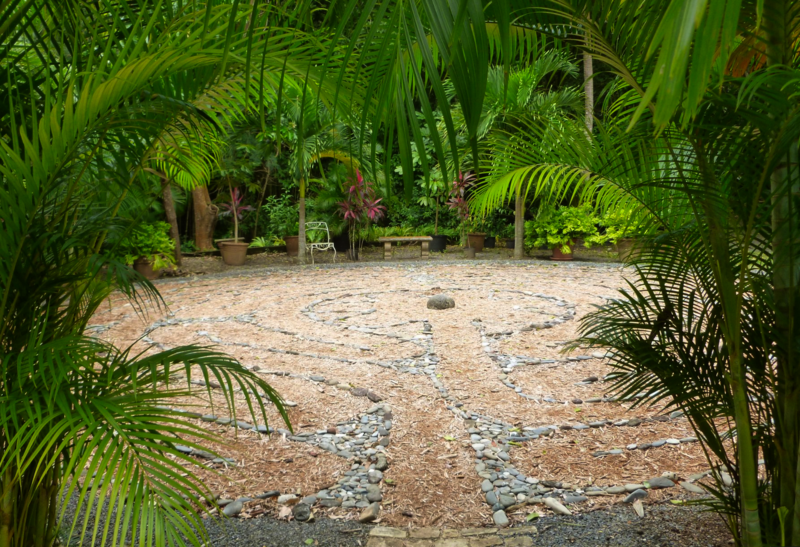 The labyrinth is a constant source of peace and interaction with nature. At one point she was dealing with a problem, and a snail crossed her path with its neck stuck way out. She learned immediately from this small creature: she must stick her neck way out on her pathway. She has learned to pay attention to whatever animals come across the labyrinth; they always arrive with a lesson! “My family and I enjoyed the serenity and peace offered as we walked the labyrinth. Of all of the places I have visited here thus far, yours is my favorite. I am enamored with the beauty, history and tranquility you have created and maintained.“ --S.S.
As the more meaningful aspects of her labyrinth work, Nancy mentions opportunities with younger school children, and special groups, such as victims of domestic violence, people in grief or suffering from debilitating illnesses, such as multiple sclerosis. She has found deep satisfaction in having the labyrinths open to the public, so walkers can walk on their own schedule and at their own pace. She has preferred this role rather than offering workshops or regularly scheduled walks, although she has certainly done these activities over time as a trained facilitator. For this quarter, I had the pleasure of interviewing Katja Zink. 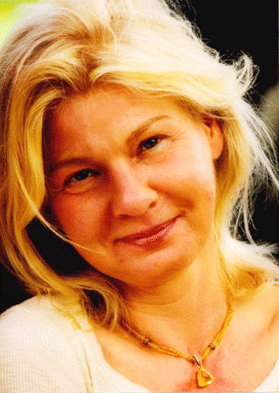 Katja is a Sustaining Giver and a major supporter of Veriditas. Her love and appreciation for Lauren and Veriditas is inspiring and joyous. When did you first encounter the labyrinth? In Austin, Texas. A couple created a little medieval labyrinth there at the Travaasa Hotel. When I was there twice I saw this labyrinth and just felt pulled to walk it. How did you get involved with Lauren and Veriditas? In 2015, I won a two week experience at the Golden Door. The second week was Labyrinth week and I wondered what that was. I hadn’t met or heard of Lauren Artress before but she was leading that week. They have a beautiful Chartres-style labyrinth there. Lauren first gave an introduction to what the labyrinth is and talked about walking it and what you might find. There was a beautiful set up that evening with candles, and a wonderful harp player. Very lovely ritual. For me it was about healing around my mother and my own femininity. Lauren’s inspiration really touched me, particularly around three words – release, receive and return. For me, this became a simple guideline for taking my wounded mother and wounded self issues into the labyrinth walk. It really was a deeply profound experience for me. The whole week was an introduction into the labyrinth for me and I totally fell in love with Lauren and her healing presence. She is a rock of authenticity and self-confidence. She really held a container for me and it was so healing for me to feel allowed to explore those places that need healing. It was a beautiful thing. 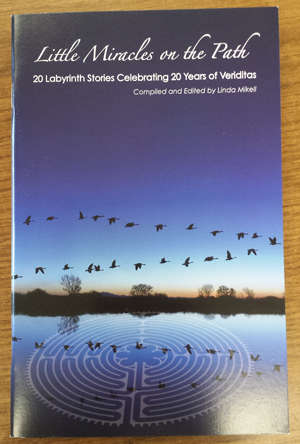 Would you share some stories or experiences with the Labyrinth and Veriditas? On my first day at the Golden Door I received information that a close friend of mine who lives in San Diego was just diagnosed with brain cancer. That woke me up to the idea that I might lose her. I felt a little like the ground was being pulled out from under me. I realized that I really wanted to go deeper and find the strength of healing and integrity within myself. I wanted the feeling of coming home to me on the path of being a woman. I made it an inner goal for myself to come to a healing place, to find a more authentic, healing ground than I had ever found. After my first labyrinth walk at the Golden Door I started feeling some profound positive physical changes that I hadn’t experienced before. At that point I felt I was reaching the center and could take that healing home with me. The labyrinth woke me up to Wow. This was the start of a new me in a way that I was finally getting away from my past family situation. I’m still in the process of healing; it’s really a gradual path. That whole week with Lauren was a turning point for me in which I realized it’s not too late to heal. I just have to be gentle with myself and go from here. And the labyrinth was my first stepping stone to doing that. My body had started to hold something in that was off center and worked against me for a long time. Through walking the labyrinth I discovered a healing ground instead of a wrestling ground with my past. The labyrinth for me is much more than I expected; it is a healing path for my soul becoming whole within my female body. I read Lauren’s books and her work. Her inspirational guidance during the trip to Chartres, including learning about the Chartres labyrinth and its history, was so wonderful for me. When I came home I went to the labyrinth at the local Methodist Church. It’s quite lovely with a beautiful view. When I go there I’m almost always there alone. I bring any problems I’m experiencing there. I went there on Good Friday with the intention of letting go of my father, who had passed on, so I could move on from the sad stories of my family. I went on that walk with that intention, praying to Jesus and the Father to release it all for me. By the time I had entered the center I really felt the freedom of it all and did some breathing exercises and cried. After I left the labyrinth I reached a deep resolution with it all that stayed with me through Easter. And that was just so beautiful, knowing what a powerful tool the labyrinth is for gaining clarity and renewal and helping me to let go and create something that starts a new movement in my soul. And for that it became more and more valuable for me. I can understand why Lauren so loves the Chartres labyrinth. Why are you a Sustaining Giver to Veriditas? This mostly comes back to Lauren and my experiences with her at the Golden Door and Chartres. My heart was deeply touched when Lauren called to thank me after I made my first big donation. She was so enthusiastic and loving. That made me think that I should become a monthly donor. Chartres was so profound for me that I wanted to support Veriditas more. I love the impact on me and I want Veriditas to survive. Basically, this is my gratitude for what Veriditas has given me and what meeting Lauren did for my life. In my heart and soul, Veriditas is an evolving movement for me. I just finished Labyrinth Summer School in California which was very inspiring. It was a soul refresher, much more nourishing than I expected. Do you want to deepen and share your involvement with the labyrinth, Veriditas, and the community of facilitators? The Veriditas Council announces openings in their Circle and invites you to complete an application for membership in the Council. The Mission of the Veriditas Council is to serve the labyrinth and the Facilitator community by strengthening connections and developing resources. Our Purpose is to develop and implement practical ways to support the work of Veriditas facilitators, and we work in cooperation and collaboration with the Veriditas Board and the larger labyrinth community. The Vision of the Veriditas Council is a strong, community-based, global network of labyrinth Facilitators, supporting the work of Veriditas. All applications for this current open period are to be submitted electronically by October 1, 2017. If you have questions about the application or the process, please contact the Council at the following address: Council@Veriditas.org. 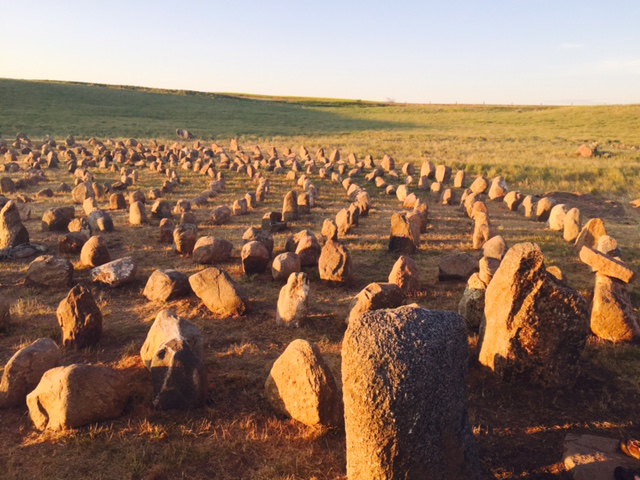 On the edge of Grasslands National Park, Canada, a new, incredibly beautiful and strong 85-foot Chartres-style grass and stone labyrinth has emerged. It is made from 500+ hand-planted ancient rocks weighing from five pounds to over two tons. Dedicated to Mary: Mary Helen Howard, the mother of the labyrinth’s steward, and Mary, the great Mother of all, this labyrinth appropriately overlooks the village of Val Marie (Valley of Mary), Saskatchewan, population 135. 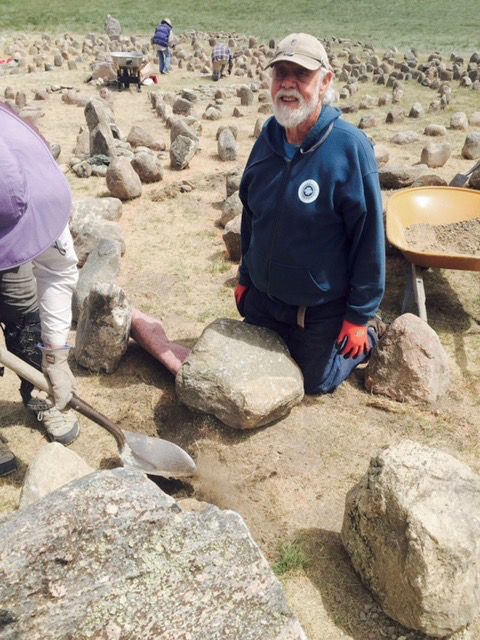 For ten days in June, Legacy Labyrinth Project volunteers worked in the dirt, grass and blazing sun, planting stones under the direction of Marty Kermeen of Labyrinths in Stone. For many, it was the most strenuous physical activity they had ever undertaken. For some, the highest spiritual experience ever had. For all, it was truly an amazing journey and a deep honor to help bring this Legacy Labyrinth into being. Susan Howard and her husband Neil Ward are the proprietors of The Crossing at Grasslands, a small family-run guesthouse. Susan describes being called to the Grasslands with a deep sense of homecoming; the 80-acre property was where they were supposed to be. It is a special place shaped by ancient glaciers and rivers crossed by wild bison herds and the peoples who depended on them for their survival. The area is still home to some of the original homesteading families. It is a land that feels like it is speaking. It is also a Dark Sky Preserve revered by astro-photographers and measurably one of the quietest places on the planet… this land provides a most noble and notable place for a new labyrinth to inhabit. Susan’s background as an ecologist and Neil’s as a photojournalist help them appreciate and share the importance of the wildlife, water, land and history of the area. The new home of Mary’s Labyrinth is located on a remnant of a homestead that is now largely inside the national park. The property is a liminal space between the village, surrounding farms and ranches, and the park. 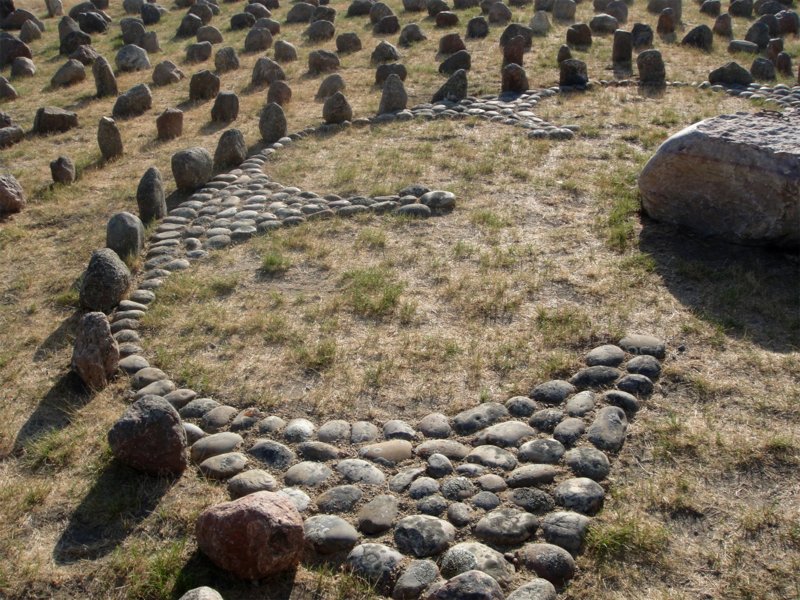 During the build, a process unfolded that included dialogue with First Nation elders about how the stones were being treated as they were placed within the labyrinth. Importance was given to honoring the land and respecting ancient traditions, as well as its potential impact on the surrounding community. Observing a delicate balance of relationship building and protocol, Susan and Neil were respectful of all inquiries, traditions, boundary discussions, and curiosities as the labyrinth came into being. It became clear that the tradition of the labyrinth and the ancient traditions of the First Nations could be honored without attempting to mix them together. “Mary’s Labyrinth is a strong container” is a feeling shared by all who helped build it, and echoed by members of the community who experienced it for the first time. Each rock has a strong and unique presence having witnessed each culture and the evolution of the Grasslands through the ages. Originally carried by glaciers, they were moved by hand or horse team into rock piles at the edge of newly cultivated fields by settlers about 100 years ago. These same stones were now planted by hand to form the paths and container of Mary’s Labyrinth. Each helps to celebrate Mary and provide a meaningful place for peace and healing. Ten volunteers, 10 large loads of rock, 10 days, a tractor, a backhoe, a designer, every-song-known-to-man-about-rocks, good food, good fun, a pickup truck and a solid intention formed the joyful foundation of this labyrinth. A dedication is offered for each Legacy Labyrinth. It includes an intention spoken by all in attendance: to connect with all other Legacy Labyrinths on the planet – and those yet unknown – in peace and healing. 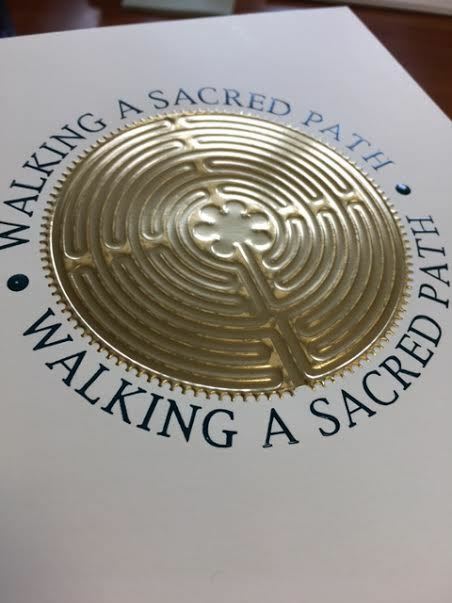 At that time, material pieces from each of the existing Legacy Labyrinths are given to the new stewards (Susan and Neil) to include in the new labyrinth as a physical connection. These ritual intentions have been led by Dr. Lauren Artress and others during the life of the Project. 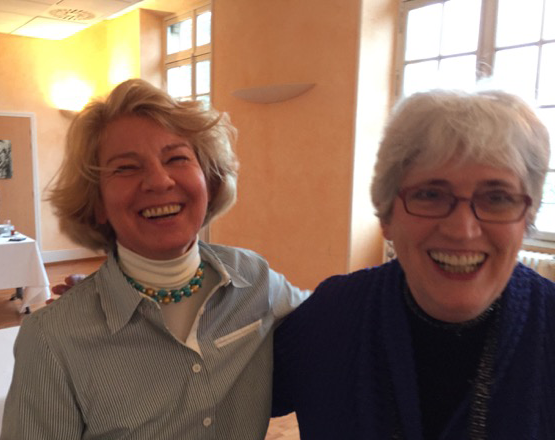 The resulting energetic connection holds and deepens all who walk, in each part of the world.In Susan’s words, “I feel blessed and appreciative of having the Legacy Labyrinth Project framework to work within to birth Mary’s Labyrinth. I know this labyrinth holds us and the land is pleased”. We are now accepting item donations for our annual online auction! Donating an item is easy! This year we are making it very simple - with a digital photo and a description of your item you can create and post your own listing directly on our auction website: www.biddingforgood.com/veriditas. If you prefer, we are pleased to offer assistance with the creation of your listing. Connect with our auction team (auction@veriditas.org) to get started! We welcome all donations to our auction - big or small! Are you an artist who could donate their creations? Do you have a special skillset or expertise that could provide a service for someone? Donation items include (but are certainly not limited to): labyrinth items, music, artwork, getaway vacations, services, books, unique products, jewelry, home & garden items, goods exclusive to your region of the nation - or the world! It's wonderful to have a wide variety in both items and price range. For more information about our annual auction, click here. 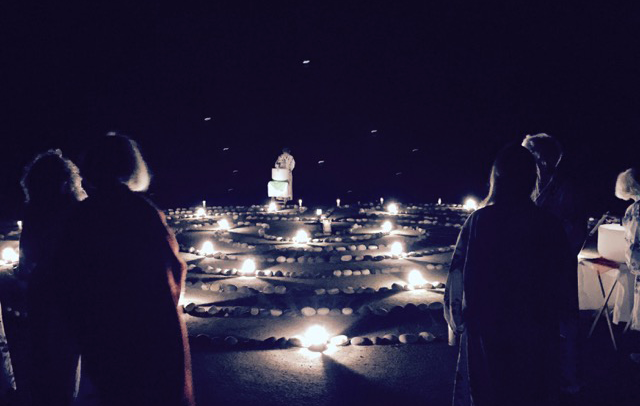 The Global Healing Response, founded in 2005 by Council member Ellen Bintz Meuch, offers an annual theme and quarterly ideas and information to enrich labyrinth walks. Quote: Darkness cannot drive out darkness; only light can do that. Hate cannot drive out hate; only love can do that. "Little Miracles" is produced by Linda Mikell. Each month she shares an inspirational story from a labyrinth experience that is sent to her by a facilitator. She welcomes YOUR story. I'm sure you're got one, and we all benefit from this sharing. Thank you, Linda! Proceeds benefit the Veriditas scholarship fund. 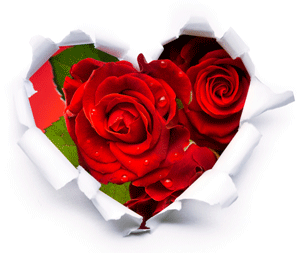 Love Veriditas and our programs? Tell your friends and "friend" or "follow" us on Social Media by clicking the icons to the right - an easy way to share the love (be sure to like and share posts with your friends) - Thank you!